Philadelphia, PA (November 3, 2008) – John Kirk, CLM, Director of Administration at Manko, Gold, Katcher & Fox, LLP (MGKF), an environmental, energy and land use law firm in Bala Cynwyd, Pa., will co-present "Going Green in Your Law Firm - It's Just Good Sense" at the Association of Legal Administrators (ALA) Regions 2 & 3 Educational Conference and Exhibition in Indianapolis, IN on Friday, November 14. The three-day conference will take place at the Hyatt Regency Indianapolis, on Thursday, November 13 through Saturday, November 15. Kirk and co-presenter, Marshall Fletcher, Sales Director for All-State Legal in Cranford, NJ will advise fellow legal administrators on the benefits of implementing a "green" program, such as supply and energy cost savings, healthier environments for employees and buildings that are developed in an environmentally sensitive manner. 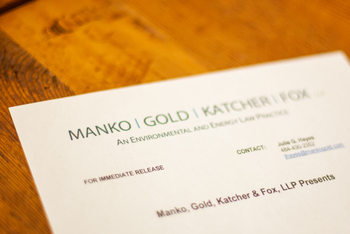 In addition, they will stress the importance of law firms keeping up with their clients' efforts in going "green." Toward this end, the presentation will focus on the American Bar Association-Environmental Protection Agency's Law Office Climate Challenge Program, the U.S. Green Building Council's LEED Rating System and strategies that will help enhance worker productivity, reduce absenteeism and lower energy and supply costs.